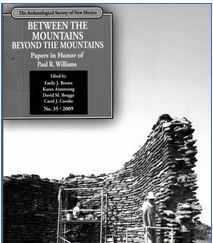 In 2008, the Archaeological Society of New Mexico dedicated its annual volume Between the Mountains - Beyond the Mountains; Papers In Honor of Paul R. Williams to Paul. The people involved in the Mesa Prieta Petroglyph Project would like to dedicate this ﻿﻿document to Paul Williams. He deserves huge appreciation and special honor for the enormous contribution he made to the project. Paul was one of the first professional archaeologists to become aware of the vast store of petroglyphs and other archaeological features on Mesa Prieta. He began thinking about ways to protect them long before the Mesa Prieta Petroglyph Project began. He was one of the project’s founders and has supported it in countless ways. One of Paul’s special gifts is his warm and generous personality. He is a real “people person” who works equally well with adults and young people. Paul’s work with and devotion to the project’s Summer Youth Intern Program has been the backbone of the endeavor. He is a born teacher who captures “teachable moments” and uses them to full advantage. Paul is a big “bear” of a man who radiates gentleness and caring. He is easy going and has a keen sense of humor that often saves the day in the field working with teenagers in the broiling sun. Paul understands community, culture, and the importance of landscape to identity. Paul’s wife Judy has also been very supportive of the project. She has unselfishly relinquished Paul to spend endless hours working on it. Those involved in the program appreciate her sense of delight and love of the Southwest.